Why there is a requirement of deep teeth cleaning? Regular brushing is the only method in order to protect the teeth from the harmful bacteria which can grow inside the mouth in the form of plaque. Some of the flossing techniques are also helpful to get rid of the food remaining, but, if the above methods will find useless, what will be the other option? What if the teeth become weaker day by day? Surely the results will be destructive! 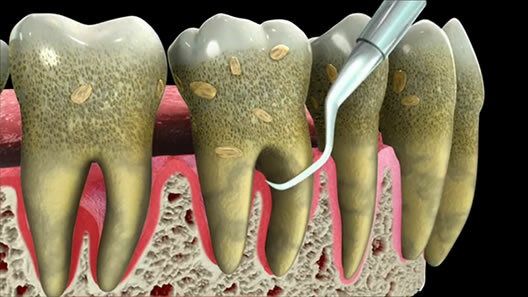 If the plaque remains untreated, it will go under the root base of teeth, creating the gap called periodontal pocket. This Periodontal pocket will be the reason of gum irritation and inflammation, termed as gingivitis. These severe oral conditions cause the loss of bone, deep down of the teeth. Oral cancers can be occurred as well if these conditions would not be treated soon. In order to avoid such a complex situation, the initial detection and treatment is essential. The gingiva should be removed from the tooth base for attainment of bacteria and plaque free teeth by using the professional methods of deep teeth cleaning – The Scaling and Root Planning. The initial step of deep teeth cleaning by using periodontal therapy involves the removals of calculus, dental plaque, stains which can be present on the tooth crowns, microbial flora and from the deeper parts extension under a gingival margin. The Scaling can be done in the form of two effective methods named, Chemical or mechanical. The chemical method includes the application of the chemical liquids, for instance, solutions of anti tartar, which prevents the tooth from tartar growth. This method is less effective than the mechanical method of cleaning. The Mechanical method involves the application of ultrasound instruments (check the working of the ultrasonic scaling procedure) or hand. The effective instrumentation only helps to split the tartar or calculus from tooth base. The next step is the root planning. It is the advanced phase of periodontal therapy which deals with the cleaning of the root surfaces along with the other infected area. It allows to clean the surface of the roots by removing the micro organisms. This step provides a smooth sensation to the roots in order to avoid the calculus. The Root Scalers and Curettes have used to perform the Scaling process. They smoothen the root walls by proper usage of instruments. The deep teeth cleaning severity is dependant on the pocket depths, intensity of hard calculus, irregular root surfaces and co- operation of the patient. The patients should discuss their painful situation to minimize the chances of pain. The severe condition of the gum diseases and the present oral condition of gingiva are the two main factors which are dependent on the deep teeth cleaning frequency. The people usually consult the dentists after feeling the pain and other oral problems. A Dentist recommends that the oral patients and smokers should visit the dental clinics for at least one time from the period of six months. For the healthy adults and children, a visit once in a year is quite enough. The patients have advised to use the mouthwash of chlorhexidine or some pain killers, after the successful completion of the process. Root Planning and Scaling deep teeth cleaning methods are essential in order to remove the remaining of tartar or plaques in order to obtain the healthy oral conditions. Thanks for discussing scaling and root Planning. I’ve been reading your posts and they’re very informative. Deep cleaning is very important to keep our teeth and gum healthy. I believe this also helps to prevent bad breath or halitosis.